The photo is just a snapshot I took with my phone of all of the things sitting on top of my dresser right now. I cleaned my room this morning and when I got home and took a second look at it, I realized how much easier it is to notice the things I surround myself with that become invisible to me through familiarity. I try to surround myself with beauty. 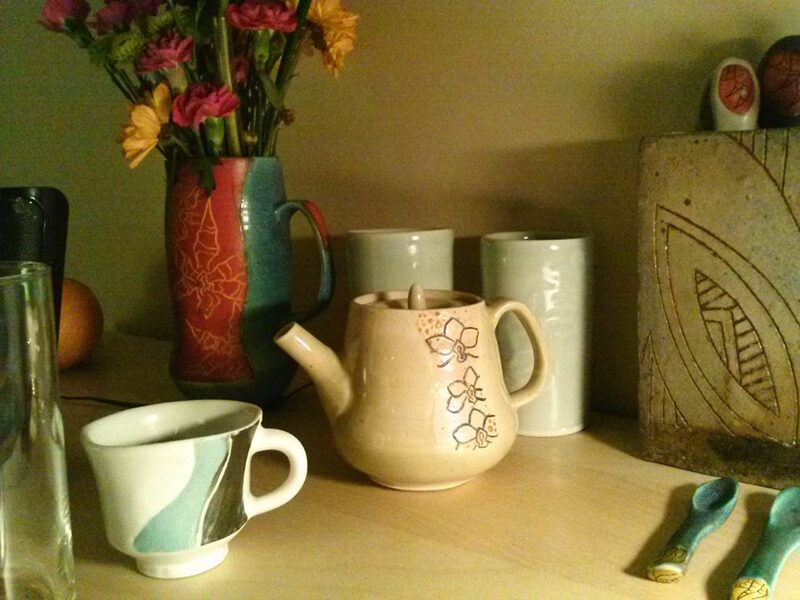 Most of the pots in the photo are pieces of mine except the rectangle flower vase. I feel the need to surround myself with other kinds of beauty besides material things. I need to make a few changes in my life to improve my surroundings. I feel like I need to fill a metaphorical void. Maybe I just need more sleep– that could be it. It feels like I’m forgetting something or not getting enough done each day. I always make a point of being productive, but maybe without a little selfless service, I won’t feel accomplished. I’ve decided to make a point of actively doing nice things for others in between what I have to get done for myself. Yesterday, I took an entire pan of chocolate chip cookie bars to the studio to share. I did eat one the night before to try them, but that was the only one I had. I gave the rest away. It felt good to do something nice. I want to try and keep the habit going by finding other ways I can do nice things for studio mates and roommates. Getting into selfish habits is a bad habit in itself. I guess I’m trying to think differently. I attended a Buddhist-inspired meeting the other night that helped me pull away from the thoughts right in front of me and see things more objectively. It’s gonna take a lot of practice and self-discipline to make it a good habit. I feel like donating some of my clothes now 🙂 I have way too many. This entry was posted in Art, Ceramics, Creative Writing, Deep Thought, Organizing, Philosophy, Stress Control, Uncategorized and tagged doing good, selflessness, service. Bookmark the permalink.